Since addiction tends to rob you of your self-worth, building and maintaining some solid self-esteem is a valuable addition to your recovery journey. “Self-esteem work, either post treatment or during early recovery, is vital to the progress of any newly sober individual,” says Rene Garcia, MS, LCDC, LMFT-A, LPC-Intern, program counselor for the Dallas Intensive Outpatient Program at Memorial Hermann Prevention & Recovery Center. 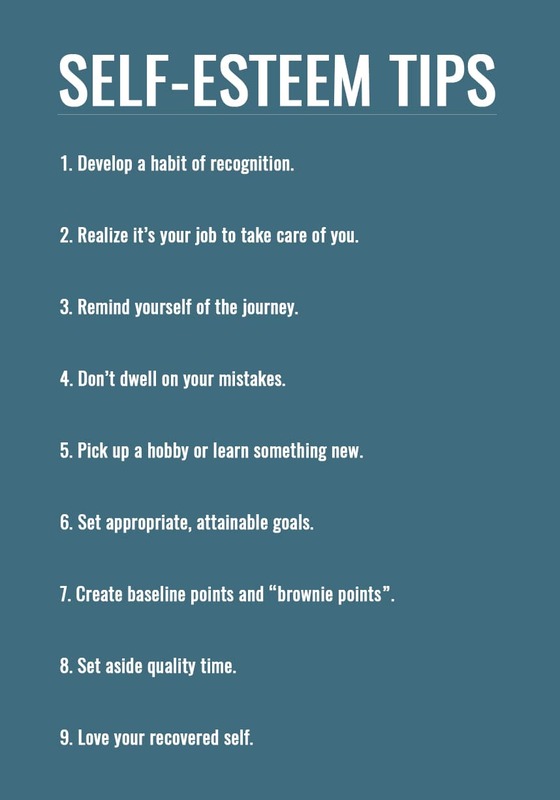 Develop a habit of recognition. Realize it’s your job to take care of you. Remind yourself of the journey. Pick up an ignored hobby or learn something new. Get a gym membership, take a class, volunteer or get creative – just do something that both occupies your time and helps you feel good about yourself. While Garcia says he sees this suggestion a lot, it’s equally important to reinforce your goals. “A great guide is the SMART model – Specific, Measurable, Achievable, Realistic and Time-bound,” he says. In a two-column list, Garcia suggests writing things that are baseline (essential) for your sobriety – things like meetings, step work and not using substances. Next, write a list that makes those baseline points fun and enjoyable. Call this your “brownie points” list. “You can stay in your room staring at the wall and not use drugs, but going on a sober bowling outing with your home group makes that down time way more enjoyable,” he explains. Nothing fancy here. “I’m quoting 100,000 people who have said ‘it doesn’t matter what your higher power is, as long as you remember it’s not you,’” says Garcia.